CLARKESVILLE — Last Friday, multiple law enforcement agencies aided in the execution of five opioid-related search warrants in Habersham and Franklin counties. Georgia Bureau of Investigation Special Agent Mitchell Posey says the arrests stem from the September overdose death of 37-year-old Adam Hicks of Mount Airy. The Habersham County Sheriff’s Office, the Franklin County Sheriff’s Office, the Appalachian Regional Drug Enforcement (ARDEO), the Mt. Airy Police Department and the Department of Corrections worked tirelessly to disband a heroin distribution ring in North Georgia and bring justice to the five-month overdose death investigation of Hicks. After identifying the drug ring’s central location, authorities executed five search warrants and charged five people with violating the Georgia Racketeer Influence and Corrupt Organization Act (RICO). The investigation also uncovered additional people from Hick’s inner circle that were distributing heroin and oxycodone (scheduled II). 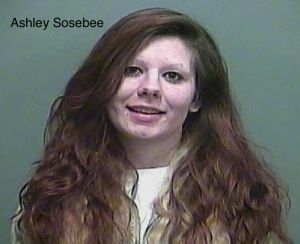 According to Posey, Habersham County authorities arrested Ashley Sosbee, 25, of Alto, for felony murder in the overdose death of Hicks. Chad Harrelson and Brandi Freeman’s residence, 550 Welcome Home Road, Mt. Airy; James Heumaneus’ residence, 399 Circle Drive, Cornelia; Bud Heaton and Karen Shope’s residence, 293 Airport Road, Baldwin; Jackie Galliher’s residence, 199 Ivy Hills Circle, Mt. Airy; Janie Rogers’ residence, 2276 Kesler Road, Carnesville. Sosbee (25); Jordan Flanagan, 25, of Alto; Brandon Burton, 25, of Cornelia; Dustin Thomas, 22, of Alto; Grant Martin, 21, of Cornelia; Jessica Hancock, 23, of Clarkesville; Patricia Blacklock, 20, of Gainesville. and Possession of Schedule II. “This investigation speaks loudly to opioid dealers that law enforcement will not sit idly on the sidelines as the people in our communities die,” the ARDEO stated.